TruScreen is an objective, self-checking digital system that can be used with minimal training, and without the infrastructure and resource costs associated with cytology-based screening. As well as high accuracy, TruScreen provides an instant report and a more humane approach to women than a Pap test because no cervical tissue needs to be taken during the test. The device comprises a hand piece, console and a single use sensor. Tissue stimulation and sensor elements are located in the tip of the hand piece probe, which is connected by cable to the console where software classifies the tissue. necessary at time of visit. Unlike cytology, TruScreen® does not only examine surface epithelial cells. Light at specific frequencies is transmitted through cervical tissue identifying changes in the basal and stromal layers. This includes increases in blood circulation and variations in blood vessels that occur with pre-cancerous change. The TruScreen® system also assesses the electrical properties and response of the tissue. The electrical measurements are stimulated by the delivery of a very small impulse (about one volt) in millisecond pulse sequences that repeat 14 times per second. The decay response curve will vary according to the capacitance of the tissue – a measurement of the ability of the tissue to either hold or dissipate a charge. Different tissue types and the properties of the tissue have different capacitance. The console has a microcomputer to calculate these tissue differences, and the results are compared to an integrated database of 2,000 patients from wide geographic and ethnic backgrounds with differing histological diagnoses. A sophisticated algorithm framework has been developed to distinguish between normal and abnormal (cancerous and precancerous) tissue. A single use sensor with precision lens and electrodes are used to interface with the cervix and protect against cross-infection. A simple series of lights (similar to traffic lights) guides the operator to place the probe on new spots across the cervix. TruScreen® has been extensively tested in numerous studies around the world, with results showing its performance is equal to, or better than, high quality cytology tests within the same study. Across all studies, the performance of TruScreen® was consistent and equal to, or better than in some studies, the comparing high quality cytology tests within the same study. In one multi-centre study, TruScreen® was shown to detect precursors of cervical cancer (CIN 1-3) at an equivalent sensitivity to a top quality Pap smear. Ongoing studies confirm this performance. Since TruScreen® results come from an objective, self-checking digital system, they are free of the highly subjective human judgment required for cellular diagnosis on conventional Pap smears. TruScreen® can be effectively used with minimal training of medical or paramedical staff to allow cervical cancer detection without the infrastructure and resource costs associated with cytology based screening. TruScree®n is also more acceptable to women than a conventional Pap test and women strongly prefer access to an immediate result. 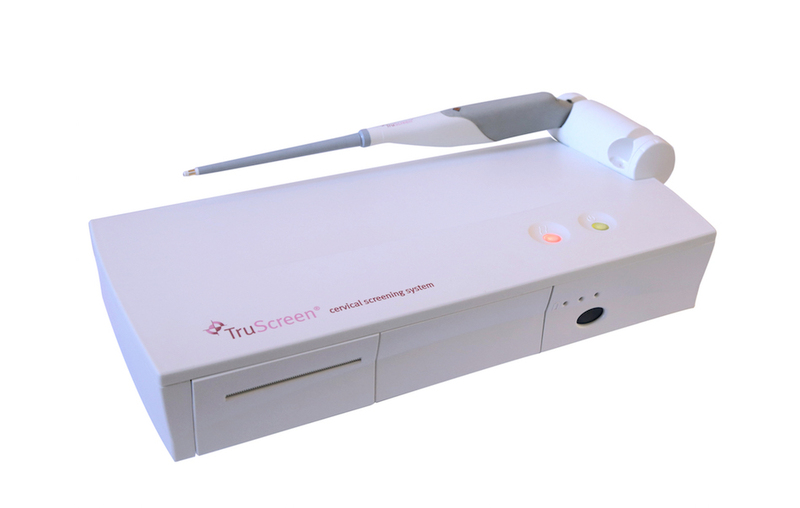 A comparative study between use of the TruScreen® and the conventional Pap test at the Whittington hospital in London showed that TruScreen® was associated with significantly less pain, pressure and scraping than experienced with the spatula or brushes used to collect cells from the cervix in cytology based screening. In the last few years, TruScreen® has intensively validated its cervical screening system in many countries including Australia, Italy, UK, Poland, China, Indonesia and Korea. TruScreen, Ltd has established a distribution network covering China, Vietnam, Pakistan, Indonesia, Philippines, Poland, Bulgaria, Romania, Russia, Turkey and Mexico. Clinical use of TruScreen in these countries has commenced and is now in a fast growth phase. The global market potential for TruScreen is huge. At saturation, hundreds of millions of women will benefit from this accurate and inexpensive cervical cancer screening method. The single most important potential benefit from the global commercialisation of TruScreen is the saving of human life – and especially the lives that will be saved in the developing world. TruScreen® is a real-time, accurate cervical screening tool for the detection of pre-cancerous and cancerous cervical cells. As well as being highly accurate, the TruScreen® system provides an instant report, thus preventing the risk of losing contact with the patient because of the delay associated with transportation of samples to laboratories for analysis and reporting. TruScreen® is an objective, self-checking digital system that can be used with minimal training of medical or paramedical staff, and without the infrastructure and resource costs associated with cytology-based screening. WHAT IS THE NEED FOR A NEW CERVICAL SCREENING TEST? Medical professionals around the world were looking for a real-time screening device to improve accuracy and patient follow up, reduce patient discomfort and the need for supporting laboratory infrastructure and make cervical screening more available to women in remote and undeveloped regions. Feedback from medical professionals also highlighted that current laboratory Pap tests are subjective and vary significantly – only giving approximately 50% accuracy. WHY SHOULD PATIENTS ASK FOR A TRUSCREEN® EXAMINATION? TruScreen® provides immediate results at the time of the visit, so that any necessary decisions about treatment or management can be made there and then, without the need for follow up information or a consultation. Also, as a medical device, the results are consistent and objective every time, and have been shown to be more acceptable to women because the TruScreen® test is painless and involves minimal discomfort. A pen-like wand touches various spots on the cervix to pick up electrical and optical signals (14 readings per second) from the cervical tissue. The TruScreen® console collects this data and compares it to known tissue signatures to provide a result. This enables the physician to immediately plan appropriate patient care. TruScreen® examinations are painless. HOW LONG DOES A TRUESCREEN® TEST TAKE? Each TruScreen® examination takes approximately 1–2 minutes. Real-time results are then available immediately. What clinical trial publications support the use of TruScreen®? Numerous clinical publications support the use of TruScreen. Continual and ongoing field evaluations also support the consistent performance of TruScreen. TruScreen has been extensively evaluated and used on more than 50,000 women globally. Studies have involved women from Australia, Brazil, Italy, Philippines, People’s Republic of China, Russia, Singapore, South Africa, Spain, United Kingdom and the United States of America. TruScreen has been shown to detect cervical cancer and its precursors just as frequently as a top quality conventional Pap test. As well as high accuracy, TruScreen provides an instant report, thus preventing the risk of losing contact with the patient because of the delay associated with transportation of samples to laboratories for analysis and reporting. A comparative study between use of TruScreen and the conventional Pap test at the Whittington Hospital in London showed that TruScreen was associated with significantly less pain, pressure and scraping than experienced with the spatula or brushes used to collect cells from the cervix in cytology based screening. Women also strongly preferred access to an immediate result. The following are some of the publications that support and validate the use TruScreen. A real time optoelectronic device as an adjunct to the Pap smear for cervical screening: A multicentre evaluation – A Singer & Associates Department of Gynecology, The Whittington Hospital London – Published by the International Journal of Gynecological Cancer 2003. Click here to read. Evaluation of a real-time, optoelectronic device ‘TruScreen’ as a primary screening tool for cervical cancer – ZHANG Wei & Associates, Centre of early diagnosis and early treatment for Cervical Carcinoma, Shenzhen Hospital of Beijing University, Shenzhen 518036, China – 2007. Click here to read. The evaluation of a real-time optoelectronic method for the detection of Cervical Intraepithelial Neoplasia (“CIN’) – Pruski D. & Associates, Gynecological Oncology Division, Department of Gynecology, Obstetrics & Gynecological Oncology, Poznan University of Medical Sciences, Poland 2008. Click here to read. A real-time optoelectronic device in screening of cervical intraepithelial neoplasia – Sung Jong Lee, MD & associates Department of Obstetrics and Gynecology, School of Medicine, Catholic University, Seoul, Korea – Published in the Journal of Women’s Medicine, Korean Society of Obstetrics and Gynecology March, 2009. Click here to read. Optoelectric Scanner TruScreen in Diagnostics of Cervical Squamous Intraepithelial Lesions – Sukhikh G.T. & Associates, Federal State Scientific Centre of obstetrics, gynecology and perinatology after academician V.I. Kulakov, Moscow, Russia. Click here to read. The Australian Experience – Itzkowic, D & Cromer, D. Gynecologist, Bondi Junction, NSW Australia – Published the Australiasian Journal of General Practice 2005 (5) 2. Click here to read. TruScreen – a new ally for cervical cancer screening – Zannardi C, Camerini T, Bucolo C. -Published Ginecorama 2001; 26: 23-4. Click here to read. Optoelectronic method for detection of cervical intraepithelial neoplasia and cervical cancer – D. Pruski and associates. Karol Marcinkowski University of Medical Sciences, Poland – Published Opto-Electronics Review.,19, no. 4, 2011. Click here to read. An optoelectronic cervical cancer screening system for screening cervical cancer: comparison with cervical cytology – HE Xiu-kui and associates, Guangdong Provincial Women and Children’s Hospital, Guangzhou China – Published (J South Med Univ, China) 2010; 30(10). Click here to read. Comparing Study of cervical cancer screening System and liquid-based cytology test in the screening of cervical lesions – Lu Siji and associates, East Hospital, Tongji University, Shanghai- Published Obstet Gynecol, Feb, 2009, Vol.18, No.2 (China). Click here to read. 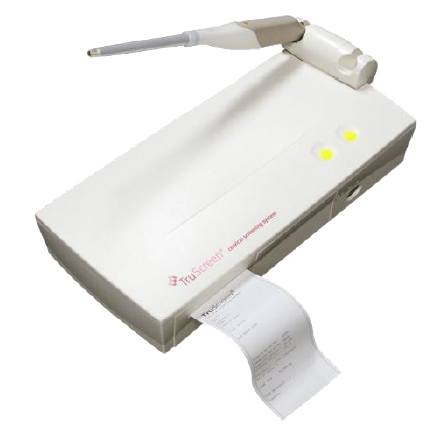 DISCLOSURE STATEMENT - This device hasn't been approved for Marketing in the US by the FDA. The availability of this and other medical devices in the U.S. require FDA marketing approval. This device counts with CE Mark and is approved for marketing in Europe, Australia, Mexico and other countries in Asia. Market availability in other countries is dependent on the country's regulatory approval process.